For the civilian use of the facility, see Don Mueang International Airport. Don Muang Royal Thai Air Force Base is approximately 40 kilometres north of central Bangkok and is the main operating and command base for the Royal Thai Air Force. In addition, units of the Royal Thai Army and Royal Thai Police have personnel located there. The first flights to Don Muang were made on 8 March 1914 and involved the transfer of aircraft of the Royal Thai Air Force. Three years earlier, Thailand had sent three army officers to France to train as pilots. On completion of their training in 1911, the pilots were authorized to purchase four Breguets and four Nieuports, which formed the basis of the Royal Thai Air Force. Don Muang RTAFB It is an active Royal Thai Air Force base, the home of the 1st Air Division, and consists primarily of non-combat aircraft. 601 Transport Squadron flies C-130H/C-130H-30. During the Japanese invasion of Thailand on 8 December, Don Muang was the site of dogfights between Japanese and Thai aircraft; the outnumbered Thais lost six planes to the Japanese. During the early years of the Vietnam War (1961–1966), Don Muang was used as a major command and logistics hub of the United States Air Force. 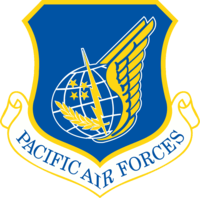 The USAF forces at Don Muang were under the command of the United States Pacific Air Forces (PACAF) Thirteenth Air Force. In April 1961 an advanced party of the 6010th Tactical Group, USAF, arrived at Don Muang at the request of the Royal Thai government to establish an aircraft warning system. Also in April 1961, a small detachment of Convair F-102 Delta Daggers from the 509th Fighter-Interceptor Squadron, based at Clark AB, Philippines were sent to Don Muang under Operation Bell Tone. Their mission was to bolster the defense capabilities of the Royal Thai Air Force. For the next several years, a minimum of four F-102 interceptors were kept on alert at Don Muang. Then in November 1961, four RF-101C reconnaissance aircraft of the 45th Tactical Reconnaissance Squadron stationed at Misawa AB, Japan, and their photo lab arrived at Don Muang. The RF-101s were sent to assist Royal Thai AF RT-33 aircraft in performing aerial reconnaissance flights over Laos. The RF-101s stayed until May 1962, then returned for a second deployment during November and December 1962. In August 1962 elements of the 15th Tactical Reconnaissance Squadron stationed at Kadena AB, Okinawa were deployed to Don Muang flying RF-101Cs. On 6 March 1962, a joint communication from Secretary of State Dean Rusk and Thai Foreign Minister Thanat Koman in which the United States "firm intention... to aid Thailand, its ally and historic friend in resisting communist aggression and subversion". As a result, the Military Assistance Command Thailand (MACT) was set up on 15 May 1962 at Don Muang. 35th Air Base Squadron - Located at Don Muang. 331st Air Base Squadron - Located at Takhli Royal Thai Air Force Base. 332nd Air Base Squadron - Located at Ubon Royal Thai Air Force Base. Detachment 1, 35th Tactical Group - Located at Korat Royal Thai Air Force Base. By mid-1964 the situation in Southeast Asia was ambiguous. North Vietnam was determined to take over South Vietnam. Communist rebel forces were making military and political gains in Laos. The United States was taking over the role of "protector" from France in the area and the fear was that communism would prevail over the democratic governments in the region. However, there was no real justification for a full-scale American military involvement in the region. On 31 July 1964 the Gulf of Tonkin Incident occurred. It was a pair of alleged attacks by North Vietnamese gunboats on two American destroyers, the USS Maddox and the USS C. Turner Joy, off the North Vietnamese coast in the Gulf of Tonkin. As a result, President Johnson would order more forces to support the South Vietnamese government, and additional USAF forces were dispatched to Thailand, beginning a large scale United States military presence in Southeast Asia. In July 1965 the 35th Tactical Group was re-designated the 6236th Combat Support Group and again in April 1966 it was re-designated the 631st Combat Support Group. In March 1965 there were 1,342 enlisted men stationed at Don Muang RTAFB, with their primary mission to provide support for all USAF units and detachments assigned to the base or other bases in Thailand. F-102s were primarily interceptors assigned to the Air Defense Command in the United States, however it was over the skies of Southeast Asia that the F-102 was to achieve its only taste of combat. Aircraft from the 509th Fighter Interceptor Squadron, based at Clark Air Force Base were sent on temporary duty (TDY) to Don Muang in March 1962 to provide air defense against the unlikely event that North Vietnamese aircraft would attack Thailand. TDY F-102As from 509th also stood alert at Tan Son Nhut Air Base, Bien Hoa AB and Da Nang AB in South Vietnam and at Udon RTAFB in Thailand. The F-102A was finally withdrawn from Southeast Asia in December 1969. The F-102A established an excellent safety record with almost ten years of flying air defense and a few combat air patrols for SAC B-52s, only 15 F-102As were lost. Although a few missions were flown over North Vietnam, the Southeast Asia-stationed F-102As are not thought to have actually engaged in air-to-air combat, although one of F-102A of the 509th FIS was lost to an air-to-air missile fired by a MiG-21 while flying a CAP over Route Package IV on 3 February 1968. Two F-102As were lost to AAA/small arms fire and four were destroyed on the ground by the Viet Cong and eight were lost in operational accidents. By 1966 the USAF and Thai Air Force had established a major presence in Thailand, with the Americans operating out of six Royal Thai Air Bases. At Don Muang the USAF had stationed KC-135 air refueling tankers from Strategic Air Command (SAC) for refueling tactical combat aircraft over the skies of Indochina. Thailand was officially neutral in the Vietnam War and the visibility of the large USAF Boeing tankers in its capital was causing political embarrassment to the Thai government. The USAF 7th Air Force in Saigon wanted to have additional KC-135's in Thailand and the solution reached was to expand the naval airfield at U-Tapao Royal Thai Navy Airfield and base the tankers there. Expansion of U-Tapao began in October 1965, with the completed new facility opening at the end of 1967. The 11,000-foot (3,400 m) runway became operational on 6 July 1966. U-Tapao received its first complement of USAF Strategic Air Command (SAC) KC-135 tankers in August 1966. By September, the base was supporting 15 tankers. The opening of U-Tapao also allowed the United States to route most cargo through that facility rather than having large cargo aircraft arrive in the Thai capital. By 1970 most USAF operations had moved out of Don Muang, however administrative personnel coordinating activities along with Military Assistance Command, Thailand (MACT) staff were assigned to the base until 1975. Glasser, Jeffrey D. (1998). The Secret Vietnam War: The United States Air Force in Thailand, 1961-1975. McFarland & Company. ISBN 0-7864-0084-6.